I am interested in the mechanisms underlying adaptive behavior in animals. In collaboration with Dr. Staddon and Cerutti, I am studying the determinants of choice in pigeons with a focus on the role of timing processes. Jozefowiez, J., Cerutti, D.T. & Staddon, J.E.R. (in press). Timescale Invariance and Weber's law in choice. 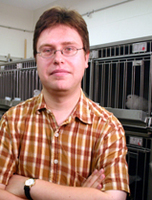 Journal of Experimental Psychology: Animal Behavior Processes.